"I'm a West Ham supporter... or is it Aston Villa? You can see right through me, I'm like a glass of water." Upon discovering The Cool Greenhouse, I felt like I had discovered the very pinnacle of DIY post-punk; looked into its soul and seen the finished article. Songs that touch cloth with the 10 minute mark, often feature the same frustrated guitar riff over and over from beginning to end, whilst simply being a breeding ground for some of the strangest and most astute lyrical hot takes. 'Cardboard Man' is a classic of this genre. 6 minutes of monotone Delta 5 riffing, in a shotgun marriage with retro bleeps and bloops, whilst frontman Tom Greenhouse assembles an array of caustic cut up one liners that take cheap shots at all the morally bankrupt, devious, 'Cardboard' men (questioning too, whether he is also cardboard – I think we're all a bit cardboard, baby). Taken from the Crap Cardboard Pet EP, out Feb 1st via Hidden Bay Records, 'Cardboard Man' is the lead single from the most complete Cool Greenhouse release to date. 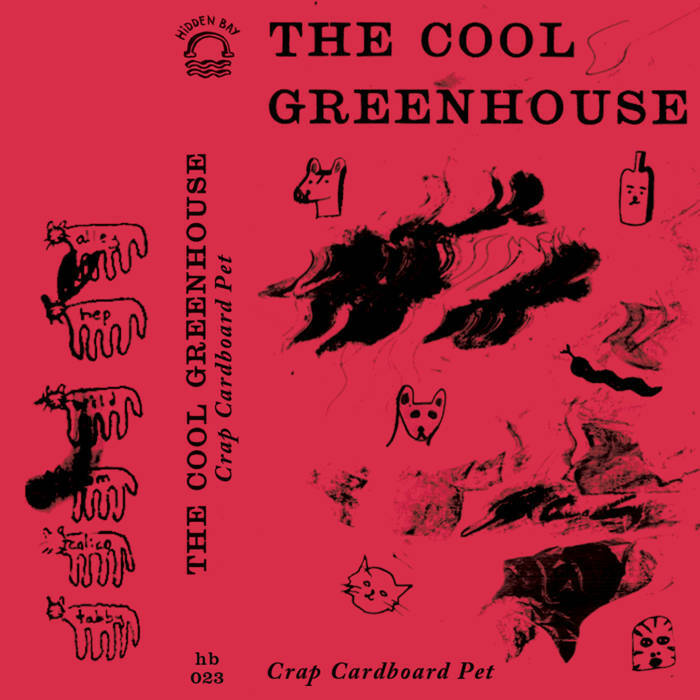 There's a lot to sink your teeth into here, but perhaps you'll have to wait until our zine comes out... for now, pre-order The Cool Greenhouse's 'Crap Cardboard Pet' EP on Bandcamp. Hear 'Cardboard Man', below, now. Dose are a group from Newcastle, whom make art rock with a thick, impenetrable wall of sound. Often, the problem with dreamier, shoegazier groups is often that everything blends into one sonic blur, but, Dose are the antidote to this. There's a lot of clarity in their music, crisp guitar melodies and vocals that hover atop the miasma like a spectral overseer. Mesmeric, gripping, Opaque is their latest offering. Urbane uncertainty and a sound driven by pedalboards that look like spaceship control desks make Dose's sound the essential soundtrack to days rich in April showers. Below, you can hear the MJ-produced Opaque, and find out more about it from Sean and Ewan from the band. Tell me about Opaque. What inspired it? We held our launch at the beginning of the month with Wild Fruit Art Collective headlining, a real Liverpuddlian thunderbolt of a band. Until then, our primary focus had been on the scene brewing in London, alongside bands from a myriad of places that weren't all too far. Now, we rotate our periscope north, to Liverpool. Whilst Wild Fruit remain amongst our favourite bands, Liverpool is seemingly crawling with other such bands that channel the same kinda gross and grimy influences into truly reptilian music. The bizarrely named Eyesore and the Jinx are our latest obsessions. Fire-breathing, yellow eyed grottabilly music on show, as they proudly unveil their debut single Gated Community. 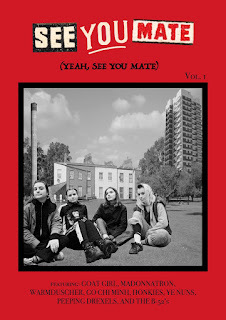 At SEE YOU MATE, we regard it as our civic duty to inform you on such groups, and so here, Josh Miller dishes the dirt on the things that make the group tick. Who is in the band, and how did you form? Can you tell me about the name? interview: WELCOME TO WHALE CITY... AND WIPE YOUR FEET ON THE WAY IN. WARMDUSCHER INTERVIEWED. Gearing up for the release to the follow up to 2015’s under the radar classic ‘Khaki Tears’, we talk ‘Whale City’ with garage-scronk madcaps Warmduscher. Featuring Goat Girl, Warmduscher, Madonnatron, Peeping Drexels, and many other friends, vol. 1 is available to buy from our bigcartel now!